It’s that time of year again when every weekend sees Wedding Fairs being held at venues across the country. This is great for us as we love nothing better than getting out and about meeting lots of lovely Brides, their families, friends and sometimes even the Groom! Wedding fairs can be a great source of inspiration and ideas and we thought we’d share again some of our hints & tips to make the best of your visits! Wedding fairs come in all shapes and sizes! From the large National/UK events lasting 2-3 days to a small 3 hour showcase at your local hotel, church hall or wedding venue. Irrespective of the size and scale, you are dedicating your time to going along so you need to make the best of it! Whatever type of show you go along to, you will be bombarded with information, leaflets, flyers, brochures, website details, etc. and this is wonderful if you’re at the very early stages of planning your wedding. If this is the case try and visit as many exhibitors as possible but don’t spend too long with each one as, particularly with the larger events, you may run out of time (& energy) before you get round to them all (yes you need boot camp fitness for this, so make sure you get in training as soon as you can!). As you go round the stands you will start to get an idea of what you like and what you don’t! As you collect your favourite ideas you can go back and speak to these exhibitors in more detail – no one exhibiting at a wedding show will mind answering any questions if you are showing an interest in the service they provide! Obviously one of the main benefits of wedding fairs is that you get to meet people who may be part of one of the most important days of your life! You get an ideal opportunity at these events to not only see what is on offer but also how you feel about the provider, how interested they are in you, their understanding of your needs and how you relate to them. 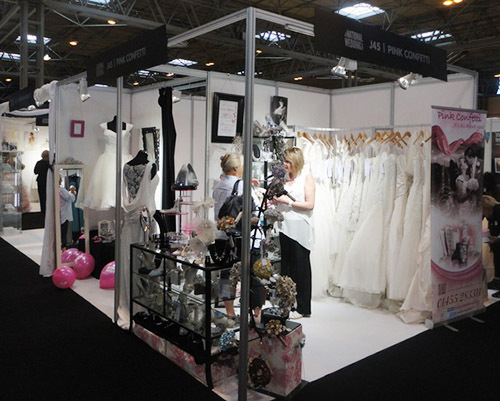 We have several brides who have said that one of the reasons they came to our shop was because of how we came across at these events – equally as many brides have also commented that they have been put off by the attitude of an exhibitor and the lack of interest shown in their plans – after all it is your day!! If you are attending these events at a later stage in your wedding planning and have a clearer idea about what you are looking for you can be more focussed on the services you need. It’s a good idea to make a list before you go so you can focus your energy on searching these out and spending more time discussing your requirements. If you have time left over you can always browse around the other stands which may inspire a different idea or two! First things first, consider who you want to go along to these events with you. You may wish to attend as a couple or make it a great girly day out! It’s good to have someone with you who can share ideas and opinions – but avoid someone who will dominate you with theirs! If you’re attending one of the major shows consider wearing comfortable footwear and factoring in breaks (might we suggest the champagne bar). If you are hoping to try on dresses think about your underwear and if you’re looking for hair accessories you might want to go with a style similar to that you’re thinking of for your big day. If there are goody bags available make sure you pick one up as there will usually be lots of information about the exhibitors and often vouchers, goodies and freebies – the bag is also useful to keep together all the other details you collect as you are looking around. Not all exhibitors will have leaflets or brochures so make sure you have something on which you can make notes – phone, tablet or good old pen & paper! If you want to take photographs, to help you remember ideas, it’s a good idea to ask the exhibitor first! Often exhibitors will have special show offers and it’s worth checking these out as they could help maximise the wedding budget! There may also be promotions advertised away from the event itself for example we use these events to promote our ‘Designer Days’ and other events. Unless you’re only popping in to see a specific supplier, make sure you have plenty of time to look around and don’t get stuck talking to exhibitors whose services you’re not really interested in! If you’re looking for dresses or accessories try and attend events where there is a catwalk show – not only are these fun to watch but you will see the dresses being worn and how they move as opposed to just on a hanger. The most important thing though is to have fun and remember that this is all about YOUR special day! Choose your companions, be comfortable, don’t get stressed, have plenty of time and use these events as big treasure chests of ideas! If you want to put these tips into practice we will be at the following events over the next couple of months and more details are on our website & Facebook page.